Lahaina, Maui – In 2003 Michael Lewis published Moneyball, his book telling how the Oakland Athletics baseball team implemented a more efficient and cost-effective way to evaluate players and strategize game situations based solely on data analysis. This approach led the Athletics to player acquisitions that other teams had overlooked or disregarded, but more importantly, led to success on the diamond. When the book came out, many a baseball expert was dismissive. But at some point they couldn’t argue with the success the A’s were having using their new methodology. For the second year in a row the Bank of America Chicago Marathon staged a no-pacesetters competition. And for the second year in a row the men dawdled throughout the majority of the course until the final miles where it became a compelling duel between eventual winner Abel Kirui (2:11:23) and defending champ Dickson Chumba (2:11:26) both from Kenya. On a perfect morning for racing the men generated the slowest winning time since 1993 (2:13:14, Luiz Antonio of Brazil) when Carey Pinkowski was still trying to resurrect the event from a near-fatal loss of its title sponsor and the ashes of the previous management. But moderate finishing times is what will most likely occur when winning is held to be more important than running fast. And you can tell which is more important by where the money goes. Just like we first heard during the Watergate scandal, follow the money. 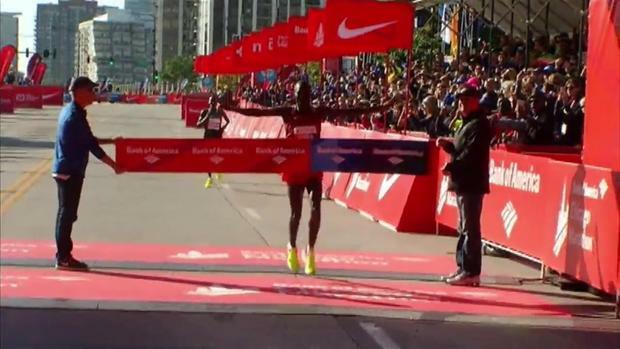 The win in Chicago was worth $100,000 for Mr. Kirui, but time bonuses wouldn’t have kicked in until 2:08. So with no pacers in place to generate early momentum, the course record bonus of $75,000 for a sub-2:03:45 (Dennis Kimetto, 2013) was all but erased from the get-go. The way the incentives were laid out — forgetting for a second the hidden appearance fee arrangements between athlete and race organization — the value accorded a win in whatever time, in this case $100,000 for a 2:11:23, was of much greater value, and much easier to attain, than an eyeballs-out risky go at an extra $75,000 for a sub-2:03:45. It’s called imposing the narrative. So until time bonuses are more heavily weighted in financial terms than simple placings, a non-paced format is unlikely to generate a fast time. That‘s why Sammy Wanjiru‘s 2:06 gold medal win at the Beijing Olympic Marathon in 2008 was so shocking. He ran fast under difficult weather conditions when there was nothing in it except risk to run fast. But that was Sammy. Ain’t a lot of him around, and unfortunately, not him either. But were people any less enthralled with today’s men’s race in Chicago? Interestingly, this theory of incentives does not seem to hold for women, as Florence Kiplagat defended her title in a sparkling 2:21:32. But except in mixed races, women have not had pacers to get the rolling. As such, they have always been racers. But a culture of pacing as standard issue has developed over time on the men’s side in this sport. So when you pull the rug out, it leaves everybody a little unsettled. The sport has not developed racers over the last generation, as much as it’s developed runners. Which is why Meb Keflezighi has stood out as a pure racer rather than a time-trialer. Abel Kirui, too, has proven to be a championship style racer with two World titles and an Olympic silver medal to go with today’s Chicago win. For their entire careers some men have prepared to run behind pacesetters developing the physical tools to run a very fast rhythm before settling, gathering, and then pushing for home. This is how they prepared physically and psychologically, because that is how we were incentivized to prepare. In that sense the sport had developed physical talents, but not psychological ones. We heard a similar give-and-take after Matthew Centrowitz won the Olympic 1500 meter final in Rio in 3:50 (equivalent of a 4:07 mile). Some people said, “oh, that’s racing, time doesn’t matter.” While others were frustrated that the race didn’t go hard and produce a Herb Elliott-like record in the Olympic final (Elliott set a world record in the 1960 Olympic 1500 at 3:35.6). Today, in Chicago on a perfect day the men went out and tempo’d through a 1:06:50 first half, then failed to even break 2:11. Some fans may be left feeling disappointed about an opportunity lost. But the sport has been so wrapped up in world records and talk of a sub-two hour marathon that pure competition alone won’t get it done for some people. We have taught racers and audiences alike that the only thing that matters is how fast they go. And fast is fun. I have heard innumerable times from Kenyan guys that they would rather run fast and finish fourth than win in a slow time. And don’t you think there may be a few performance enhancement consequences to such a time-based focus? Only an extended period of non-paced racing can break the hold that an only-fast-counts mentality has created. You just wonder if a no-pacers format might better serve the long-term interests of the sport and the Abbott World Marathon Majors circuit, as only the three American marathons hold to that format now. Ironically, only time would tell. As might be expected in any nation with a talent pool as vast as theirs, Kenyans continue to debate the makeup of their 2016 Rio Olympic Men’s & Women’s Marathon squads. They also pray that the non-compliance ruling handed down last week by the World Anti-Doping Agency (WADA) doesn’t derail their heroes from competing in Rio this August. Yet even amidst those attention-grabbing headlines, we are sadly reminded that it was on this day in 2011 that Kenya lost its legendary 2008 Olympic Marathon champion Sammy Wanjiru, who died tragically when he fell from the second story balcony of his home in Nyahururu during a domestic dispute. Wanjiru was only 24 years old at the time of his death, and still had room to grow as an athlete. The following excerpt is taken from my blog the day after Wanjiru’s death. “I won’t offer any speculation except to suggest that youthful fame and fortune are never simply a single-edged blade carving happiness from a rough-hewn upbringing of need and want. Over and again we have witnessed the tragic cuts that sudden wealth and corresponding sycophancy can lay open on those ill-prepared to parry their thrusts. Sammy Wanjiru was a passionate racer, and evidently he carried that passion into his every day dealings to a calamitous, untimely end.